A bowl full of proteins and fibre and who could say no to this. After the first time I tasted this I got hooked to this recipe and remember demanding my mother to make this each and every other day. I never got tired of eating this at all. Here goes my version of doing this. 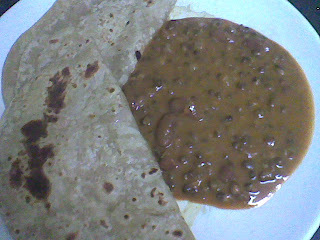 Soak both the lentils and the beans for 8 hours or overnight, the green gram just an hour before u start cooking. Pressure cook together till they are soft. Chop the onions and tomatoes finely. Slit the green chillies. In a kadai heat the ghee and add the cumin seeds. When they splutter add the chopped onions and green chillis and sauté the onions turn pink. Now add the ginger garlic paste and fry till the raw smell disappears. Add the turmeric, red chilli powder and salt and mix well. Now add the chopped tomatoes and cook for 5-6 minutes. 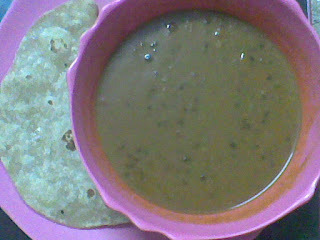 Add the pressure cooked dals along with a cup of water and mix well till they are well coated with the masala mixture. Cook covered till it comes to a boil on a medium heat. Add butter, mix well and cook for 5 minutes. Add the cream and garam masala, mix well and serve with hot rotis. This is off to RCI: Haryana hosted by Easy Crafts.